Lakemont is an upscale neighborhood in both Bellevue and parts of Issaquah; in fact, neighborhood children attend the Issaquah School District. 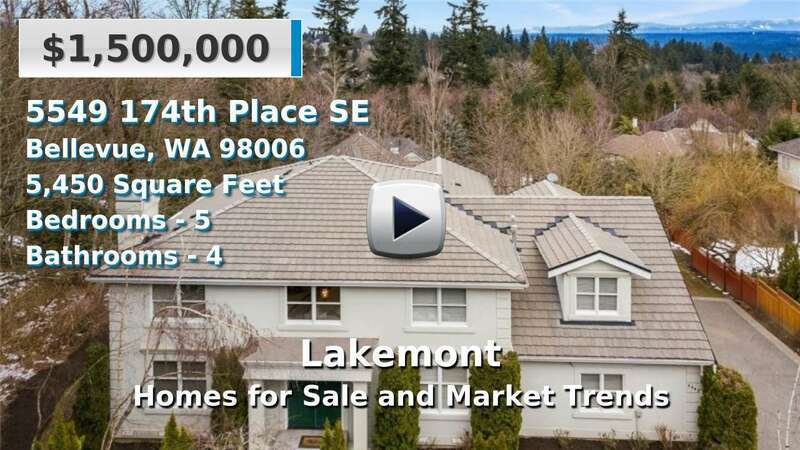 Homes for sale in Lakemont are set on quiet, winding streets and are generally large, stately single family residences with 4-5 bedrooms and views of Lake Sammamish and the mountains. Homebuyers may also find condos for sale in some of Lakemont's neighborhoods. Lakemont residents enjoy parks, sports fields and courts, and live near Newcastle Golf Club and Cougar Mountain for a wide array of recreational and fitness opportunities. View every home, condo, and property listed for sale. Sorted by newest listing first. Updated 6 minutes ago. 4 Beds | 3.25 Baths | 3340 sq. Ft.
4 Beds | 2.5 Baths | 2820 sq. Ft.
5 Beds | 3.5 Baths | 3330 sq. Ft.
4 Beds | 2.5 Baths | 3460 sq. Ft.
6 Beds | 5 Baths | 7370 sq. Ft.
6 Beds | 4.75 Baths | 6060 sq. Ft.
4 Beds | 3.25 Baths | 4210 sq. Ft.
6 Beds | 4.25 Baths | 5761 sq. Ft.
4 Beds | 2.5 Baths | 3800 sq. Ft.
5 Beds | 3.5 Baths | 6220 sq. Ft.
4 Beds | 2.5 Baths | 3552 sq. Ft.
13 Beds | 9.25 Baths | 15360 sq. Ft.
4 Beds | 4 Baths | 3510 sq. Ft.
5 Beds | 2.75 Baths | 2430 sq. Ft.
4 Beds | 3.25 Baths | 4240 sq. Ft.
4 Beds | 2.5 Baths | 3210 sq. Ft.
5 Beds | 4.25 Baths | 5450 sq. Ft.
3 Beds | 3 Baths | 3600 sq. Ft.
4 Beds | 3.5 Baths | 4840 sq. Ft.
4 Beds | 3.25 Baths | 3330 sq. Ft.
Blue Summit Realty has the most accurate and up to date Lakemont real estate listings on the web. Currently there are 25 homes for sale, and 5 vacant land properties in Lakemont. Of the 30 total Lakemont residential listings for sale 0 are bank owned, 0 are short sales, 0 are new construction, and 0 are townhomes. The price ranges from $1,125,000 to $0 with a median list price of $1,717,235 and median sold price of $1,290,350. Make sure to refine your Lakemont real estate search by property type, price, square footage, bedrooms, bathrooms and more with the search tool above or view the Lakemont listings on our interactive map. Our Lakemont real estate listings were updated 6 minutes ago.